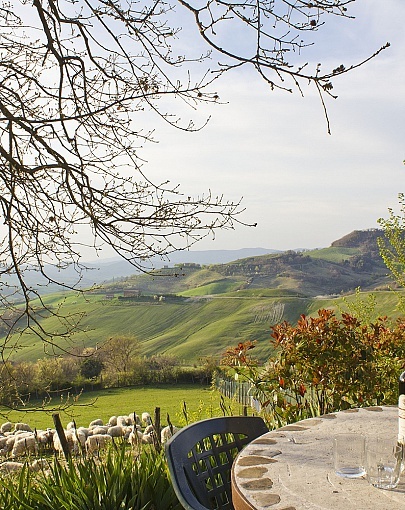 In the very heart of an unknown and unspoilt part of Tuscany where life still follows the pace of nature sits Agriturismo Belforte, a Tuscan farmhouse surrounded by stunning views and wild nature. The farmhouse offers 3 apartments and an independent barn, all restored with care and attention to detail. A large garden offers an inviting swimming pool and magnificent views over the surrounding hills and the nearby hilltop village of Radicondoli. Besides Radicondoli, the view includes Montecastelli and Monteguidi and stretches as far as the Etruscan city of Volterra and the wonderful San Gimignano, both within 40 minutes motoring. The farm extends over more than 90 hectares of eco-farmed land. Besides poultry, we breed Sardinian Sheep for the production of milk and cheeses. Agriturismo Radicondoli is a quiet place for gaining new strength, allowing for relaxation by the panoramic pool or taking sightseeing daytrips, experiencing Tuscan village life, walking in unspoilt, breathtakingly beautiful countryside or exploring the ancient spas scattered around the valley. Pietro and his family are very warm, generous, positive and fun loving Sardinians who often organise large dinners with friends from neighbouring farms, improvise playing, singing and dancing to which all guests are always invited. Il Podere, originally the farmer's own house, features a very large and cool open living area which used to host large dinners at the end of the hard farming days, a large fireplace and a fully fitted kitchen. Off the living room are a double and a twin bedroom and a large bathroom. The apartment can sleep up to 4+1 (110 sqm). Besides the beautiful apartment - the highlight is the private panoramic terrace (100sqm) with pergola, BBQ, table and chairs. La Terrazza, converted from an old Winery, is now the largest unit at Agriturismo Radicondoli. Sitting on the ground floor, below Podere, the apartment features a large open living area with a fully fitted kitchen, two large bedrooms (one twin and one double), a storage room and one bathroom. La Terrazza is suitable for up to four adults and three children. La Parata, converted from the farm’s old warehouse, is now a wonderful ground floor apartment featuring a large open living area/kitchen with fireplace, two bedrooms and a bathroom. The apartment has also an en-suite dependence with an independent entrance which sleeps 2. The apartment is therefore suitable for up to 6+1. The front of the house offers a lovely panoramic garden with table, chairs and umbrella for outdoors eating and BBQ. 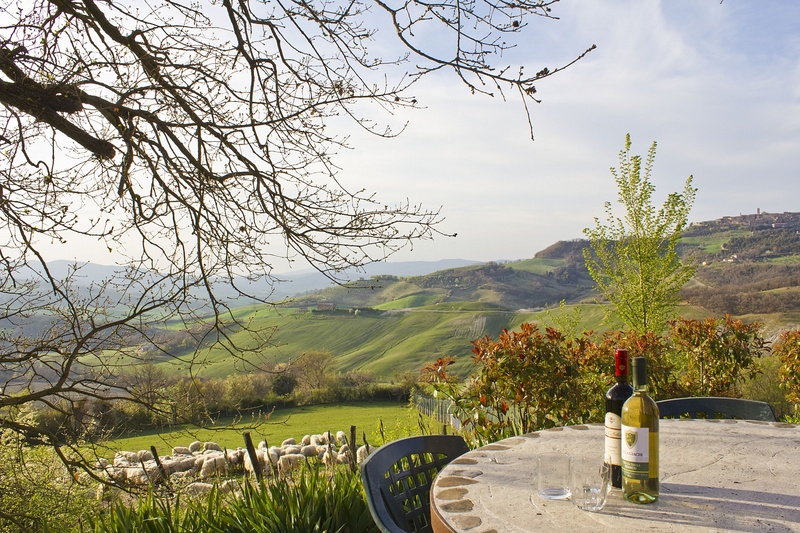 La Capanna is an independent barn featuring a lovely open living area with a fully equipped kitchen, a welcoming fireplace, sofas and stunning views over the valley and village on the hill opposite. The two bedrooms sleep up to 4 comfortably. The barn is equipped with private outdoors eating facilities and a BBQ.